In noncommercial kitchens, bulk cooking and fast food prep are commonplace, and with high volume service, much like in restaurant kitchens, there’s risk of injury among staff if there aren’t proper procedures in place. Protecting staff from potential injury doesn’t have to involve lengthy training sessions or costly changes in operations. Rather, small changes can make big differences, and can save operators from having to spend a lot of money paying for onsite injuries and workers compensation claims. 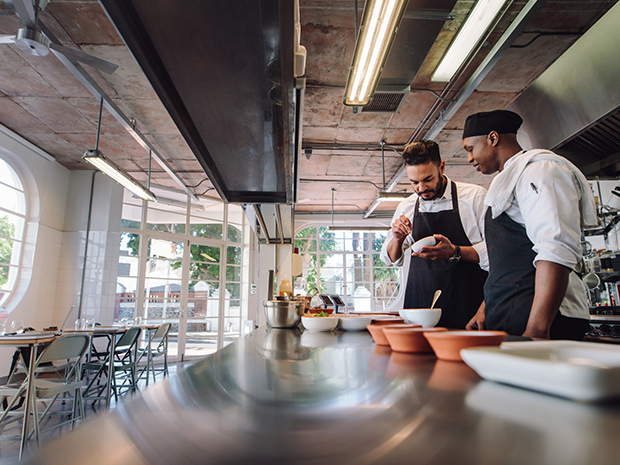 Make safety an integral part of the restaurant’s core business objectives by identifying common restaurant injuries and creating guidelines for how to avoid them. Properly maintain your kitchen and provide your staff with adequate training, cleaning and emergency protocols that help prevent fires. Invest in safe and smart technologies that remove the human element as much as possible and create a safe environment for all workers. Beyond slip-and-fall injuries, kitchen operators should be aware of burns, which can be quite severe. Whether from food handling or working with the cooking oil, kitchen burns can not only be costly for operators, but it can cause staff to need extensive time off while they heal. With increased throughput in kitchens and the need for speedy service to create value for diners, proper safety measures are more important than ever. Implementing technologies that can help prevent slip-and-fall injuries as well as burn injuries can be one of the best investments a kitchen operator can make. Kitchen fires can also be a devastating issue. From open flames and cooking oils to cleaning chemicals and electrical connections, a devastating blow is only on spark away. Caused by normal, everyday cooking processes, the grease buildup on hoods and other critical kitchen equipment can cause disastrous fires that cause a lot of downtime, as well as burns and property damage. According to the NFPA, nearly 8,000 eating and drinking establishments report fires each year, accruing an annual average of $246 million in direct property damage. That’s why prevention, training and preparedness are absolutely essential. By installing an automated system that cleans hoods and other equipment on a daily basis, operators can help avoid these costly and dangerous problems and extinguish a big fire hazard in their kitchens. Increasing kitchen safety can be as simple as rethinking oil management procedures. In fact, automating the cooking oil handling processes within a facility can not only help with kitchen safety, it can also create cleaner and better-run spaces. For instance, instead of having to shut down a fryer or call in a cleaning crew for oil replacement, disposal or filtration, automated systems and equipment can take care of the job at just the push of a button–making it easy and safe your employees to do their job. Mitigating fire risk along with helping to prevent workplace injury are two huge benefits from automating oil management, and in high-volume foodservice locations, the need for safety and cleanliness is paramount. Ensure your employees have a safe work environment by reassessing your kitchen procedures, from hood cleaning to oil management and beyond.